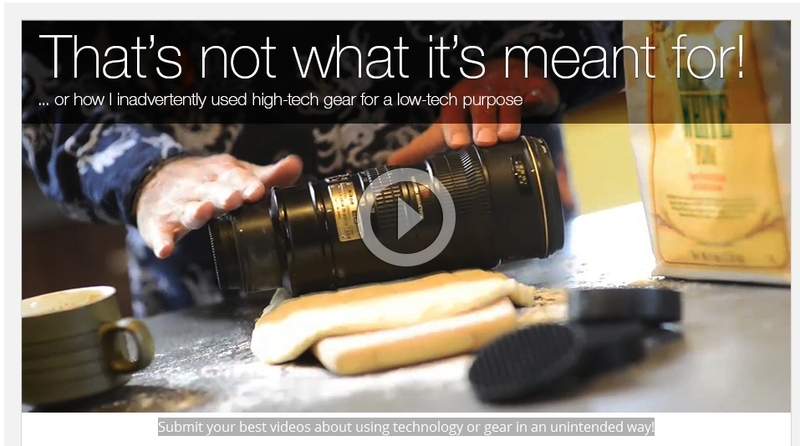 B&H Photo announces a contest for the best videos portraying the use of technology or gear in an unintended way. 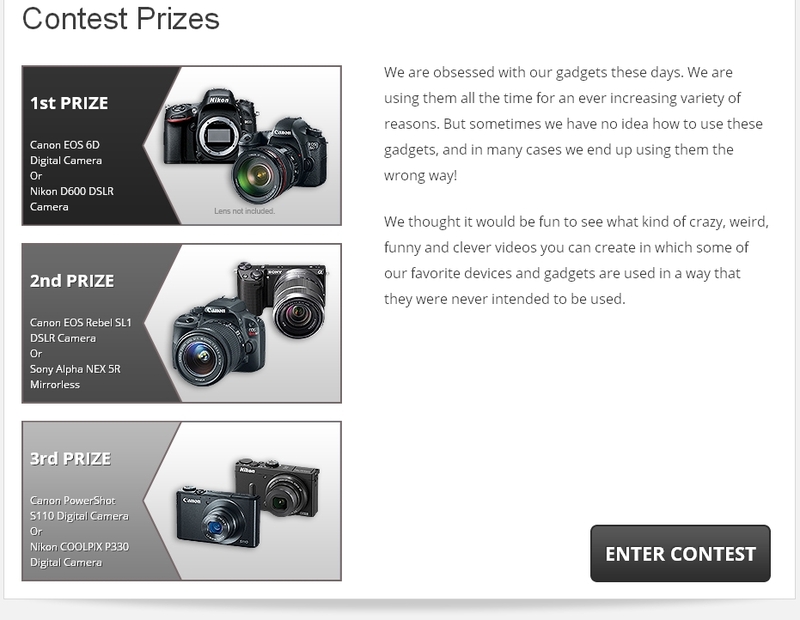 The Grand Prize Winner will receive a Canon EOS 6D or a Nikon D600. Submit an original video about using gear or technology in an unintended way for a chance to win a full-frame Canon or Nikon DSLR Camera and other prizes. Submit an original video about using gear or technology in an unintended way, for a chance to win a full-frame Canon or Nikon DSLR cameras and other prizes. A Canon EOS 6D DSLR full-frame 20.2MP camera offering exceptionally high image quality and detail, while providing compatibility and convenience through its design and features, or a Nikon D600 DSLR camera featuring a full-frame 24.3MP FX-format CMOS sensor in a compact form-factor. A Canon EOS Rebel SL1 lightweight APS-C format DSLR camera with an 18MP CMOS sensor and the DIGIC 5 image processor, including an 18-55mm f/3.5-5.6 lens for an effective range of wide angle-to-standard focal length shooting options, or the Sony Alpha NEX-5R Mirrorless Digital Camera with an 18-55mm f/3.5-5.6 E-mount zoom lens, which is an ideal first lens to get one out and shooting. With a 35mm focal length equivalency of 27-82.5mm, you have true wide-angle capability, and can range up to standard telephoto length for drawing distant subjects close. The Canon PowerShot S110, an advanced compact digital camera with a 12MP resolution 1/1.7" CMOS sensor, redesigned high speed autofocus, and 3.0" touch screen display. It also shoots Full HD video and RAW files in several aspect ratios, or a Nikon COOLPIX P330 digital camera equipped with a 12.2MP 1/1.7" Back Side Illuminated CMOS image sensor. Its 5x Zoom-NIKKOR ED glass lens utilizes Vibration Reduction technology to compensate for camera movement, and to help one capture clear shots even with unsteady hands. Everybody is obsessed with gadgets these days. People are using them all the time for an ever increasing variety of reasons. But sometimes people have no idea how to use these gadgets, and in many cases they end up using them the wrong way! B&H Photo thought it would be fun to see what kind of crazy, weird, funny and clever videos can be created in which favorite devices and gadgets are used in a way that they were never intended to be used. The top ten will be chosen by the social media team and/or celebrity judges. As the world's largest source of photography, video and audio equipment, B&H Photo-Video is known worldwide for their attentive, knowledgeable sales force, and excellent customer service, including fast, reliable shipping. Visitors to the website can access a variety of enlightening articles and educational videos. B&H has been satisfying customers worldwide for close to 40 years.